This years Samain Celtic Festival is on Friday 31st of October at our regular haunt, Stallet. 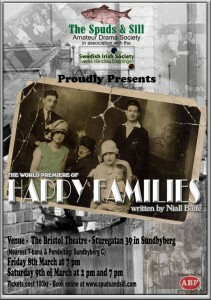 Spuds and Sill will be hitting the boards together with great traditional and modern musicians from Sweden and Ireland. We will be performing an excerpt from the deliciously creepy A Skull in Connemara as well as a newly writen piece by Stockholm-based playwrite Niall Balfe, The Ghosts of Samhain. Niall has also writen our offering for next spring, stay tuned for more on that! Tickets are 150kr and available from Ticnet. See you there! Samhain is one of the four major celtic festivals, a harvest/winter celebration and liminal time when the spirits more easily pass into our world. The feasting, offerings to the sí and wearing of disguises remains today in the celebration of Halloween. Pre-booking closed, try on the door! 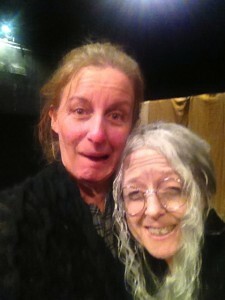 Opening night was a great success and at 2pm we get to do it all again! We have good availability at the door for the matinee, and limited availability on the door for the evening show at 7pm. Come by and we’ll squeeze you in somewhere. As they say in Sweden, there’s room in our hearts so there’s room for your bum (no really, they say that!). As always, small notes and change appreciated on the door and at the bar. A film team have arrived from Hollywood to the tiny west Ireland islands of Aran. The islanders are all hoping to find stardom and a release from provincial poverty, especially Cripple Billy. The Cripple of Inishmaan is a black comedy by Martin McDonagh, best known as the writer and director of international box office hits In Bruges and Seven Psychopaths .Set in the thirties in the Aran Islands off the west coast of Ireland, The Cripple of Inishmaan has recently enjoyed an enormously successful run in London’s West End starring Daniel Radcliffe and is heading to Broadway in the spring. 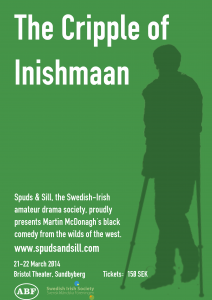 But first, Stockholm as performed by Spuds and Sill, the amateur theater branch of the Swedish Irish Society. Click here to book online for 21 and 22 March, tickets 150kr. Members of the Swedish Irish Society will be getting a discount code in their email soon, so now is the perfect time to join SIS! We have now closed for pre-booking so we can concentrate on the finishing touches for opening night. The venue is fantastic though so we do have availability at the door if you are more of the spontaneous type, drop by Bristol Theater in Sundbyberg. Curtain up at 7 on Friday as well as at 2 and then 7 on Saturday. 100kr cash at the door, cash in the cafe and winebar. Would be great to see you!